Jammu: Young, Energetic Singers and Musicians of Jammu presented “Music with a Mission” a Dogri Music Concert at Spring blossoms Public School, Jammu. Nirvana Academy a regd. cultural club in collaboration with J&K Academy of Art, Culture and Languages organized. Dogri music concert to promote Dogri regional and folk music among the youth and school going children. Sh. Vikrant Dogra, Vice President Federation of Indian Blood Donor Organizations was the chief guest on the occasion while Sh. Sumit Sharma and noted musician was the guest of honour on the occasion. Programme commenced with the welcome speech presented by Sh. Hitesh Badyal, Founder member Nirvana Academy followed by a Dogri group song presented by school children. 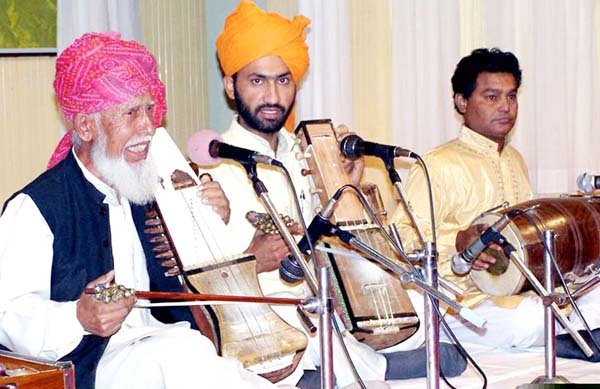 A Dogri music concert was presented by various Dogri Folk and Regional Artists of Jammu with a mission to save Dogri language and culture. Deepak Kumar, Shivankur Bharti, Kuldeep kumar, Anmol Amla, Sanjay Kumar, Seema Dogra, Nandini Kapoor and Chandini Kour mesmerized the audience with Regional and Pharai Dogri Songs. Music Director Sumit Sharma, Amit Sharma, Sonu, Rakesh and Neeraj accompanied the singers on music instruments. While speaking on the occasion Sh. Vikrant Dogra applauded the performances of the artists and said that these kind of program provides firsthand knowledge of art and culture of the region to the youth and children. Meenakshi Sharma, General Secretary Nirvana Academy thanked the Secretary, J&K Academy of Art, Culture and Languages for financial assistance and their kind support. Tanuja Chahar and Rohit Sharma anchored the programme.